Cream crackers are flat, square, crispy crackers with distinctive air pockets and a lovely creamy, savory flavor. As a kid, cream crackers spread with butter and jam, accompanied by a glass of cold milk provided the perfect supper time snack. When I was grocery shopping at my local Kroger store here in Kentucky a few days ago, I spotted a familiar orange, rectangular package on a shelf marked “special orders.” Subconsciously, my brain forced me to stop for a closer inspection. To my delight it was indeed a package of Jacob’s cream crackers, all the way from Ireland, beckoning me from their lonely spot on that not-so-popular, strange, foreign foods’ shelf. And so, I placed them gently in my cart, proud of myself for saving them from Kroger’s unwanted, discarded stack, and all for the bargain price of $1.99. When I decided to write a blog post about my cracker discovery, I did a little internet research on the history of cream crackers. 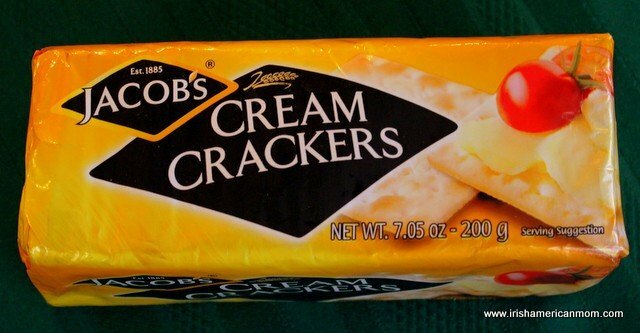 I always knew cream crackers were made by Jacob’s bakery in Dublin, but part of me always assumed the recipe originated in England, like so many other Irish foods. To my delight I discovered the cream cracker is a true, Irish original, and an authentic “taste of Ireland”, and “a taste of Dublin” to boot. 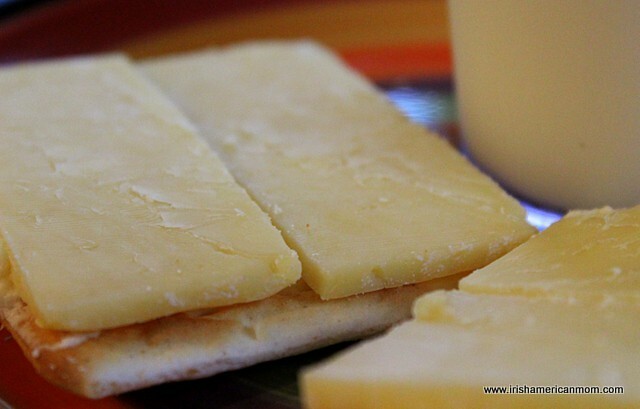 Joseph Haughton, a Dublin man, invented the cream cracker in his home. 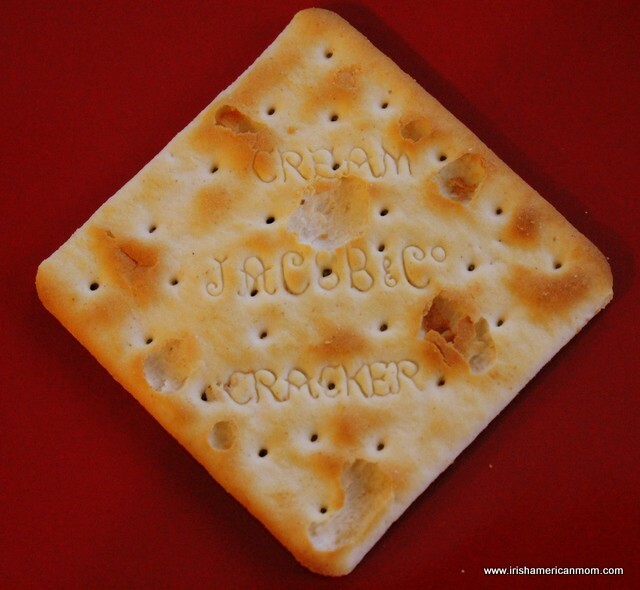 The first crackers were baked commercially by William Jacob around 1885. Ever since, Irish people have been enjoying them served with cheese and other savory or sweet toppings. 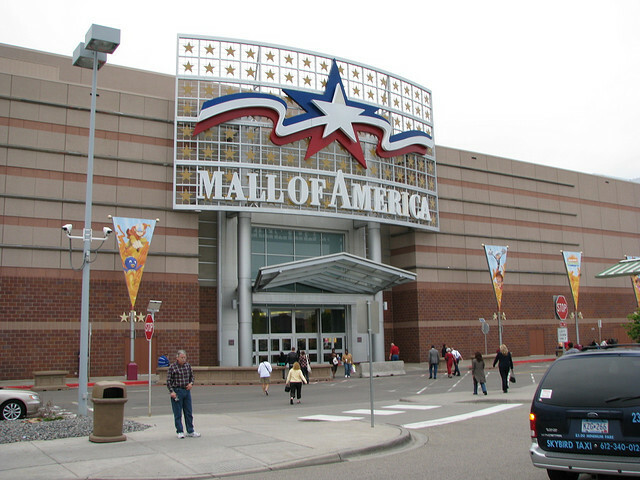 Their popularity spread throughout the United Kingdom and as far afield as southeast Asia. Here in America the closest cracker is probably a Matzo. When you bite a cream cracker a few stray flakes may fall, but they do not crumble into bits like many other appetizer crackers. They are also perfect for thickening a clam chowder soup. The ingredients include wheat flour, palm oil, sunflower oil, salt, sodium bicarbonate and yeast. Looks like today’s recipe may still be pretty close to Haughton’s original. I could find no additional artificial anything or hydrogenated oils on the short list of ingredients. One significant omission for me was no mention of cream to support their famous name. Apparently, the name refers to the method in which the mixture is creamed during the manufacturing process, not an actual ingredient. 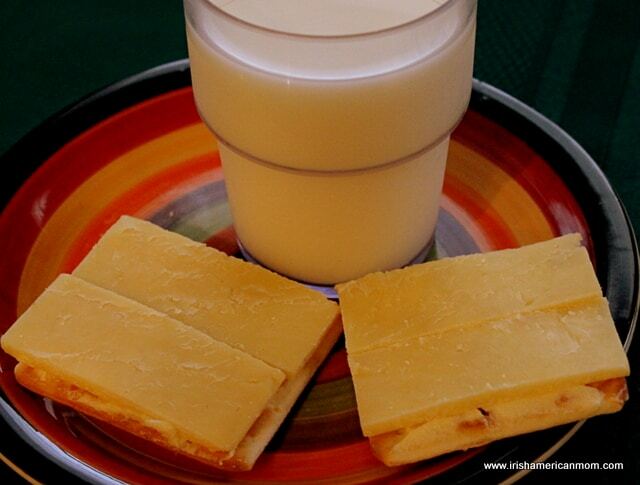 And so, when the kids are tucked in bed tonight, I think I’ll pour a glass of cold milk, butter a few cream crackers, adorn them with slices of Dubliner cheese, then savor my truly Irish snack. P.S. 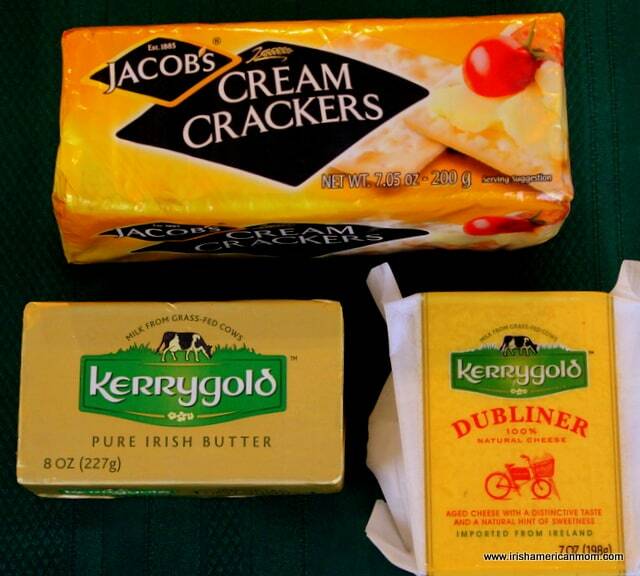 Neither Jacob’s nor Kerrygold have ever heard of me. I just love Irish cream crackers and cheese. I love cream crackers! I would love to find them in the cheap buggy at Kroger’s! Lucky you! Kay – I am putting the kettle on right now for a cuppa tea and some cream crackers with lashings of butter. 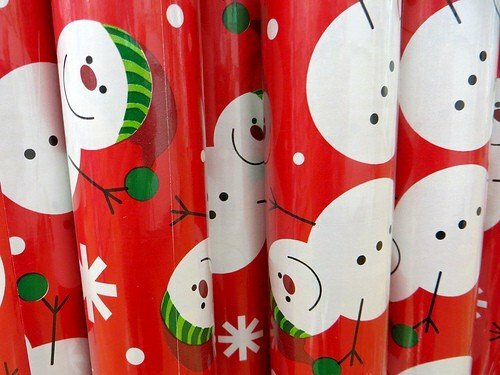 I’m going to enjoy them while they last. Have a great weekend. The Cream refers to the colour of the flour. Actually the story of them is a bit more interesting than that, and far far older. Originally they were army and naval rations. And not Dublin, but Waterford and Cork during the Napoleonic Wars, and were probably used by Irish Regiments on the frontier during the French and Indian Wars. They were used by fishermen on the Newfoundland Banks. And of course the triangle trade. We weren’t all Saints and Scholars. PPS. Oh there are a good few from Tipperary over your way, Coolmore&co, so there is probably a shop someplace that has Lyons or Barry’s tea and Tayto’s C&O/S&V. Hi Vince – Once again, thanks so much for adding all this great information. The history of cream crackers is far longer than I thought. I had no idea they were so interesting and had such an illustrious military past. I’ll be thinking of all the soldiers who ate cream cracker rations in years gone by, as I savor them at supper time each night. Here in Louisville we are lucky to have an Irish shop beside Molly Malone’s pub, and I can get quite a few Irish foods there. There’s nothing in the world like a bag of Tayto’s. Of course, I can’t get a batch loaf to make a Tayto sandwich – that treat is reserved for breakfast the moment I arrive home. Hi Mairead, finding a familiar long ago food favorite, nothing better,and a bargain to boot. I have to confess that the container of Kerrygold Butter is the flavor I miss. Nothing like fresh Irish butter. 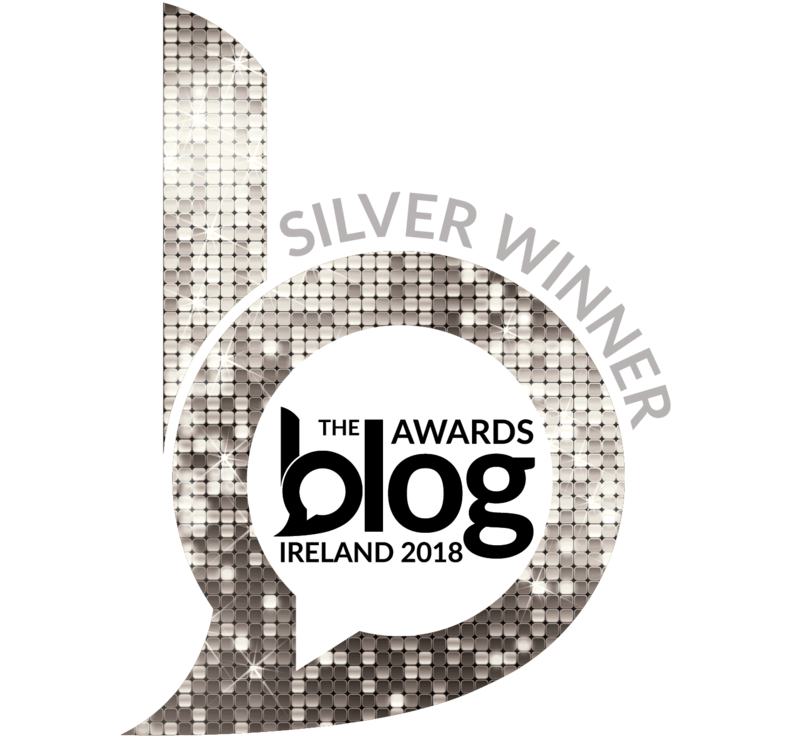 Brian – Kerrygold butter is probably the best butter in the world – I am biased though. I can buy it here at Whole Foods or Costco. I love to bake with it – I just think cakes are a little more flavorsome when baked with it. Aimee – I don’t eat a lot of crackers either, but once I spotted cream crackers which reminded me of my childhood, I couldn’t resist. This is clearly the perfect place for my question! I bought a nice assortment of jams for Christmas gifts and am hunting around for the best crackers to go with them. Though I see that the ingredients for cream crackers include neither sugar nor cream, I think I’m still getting hung up on the word “cream.” While you can pair just about any cracker under the sun with cheese, that isn’t the case with jams and jellies, so I want the least sweet cracker I can find. I remember having water crackers with butter and jam when I was a kid (we’re English/Scottish, not Irish), but I’ve never had cream crackers. If you had to choose between cream crackers and water crackers to pair with different jams – and, just the for sake of being impartial (:-), let’s pretend that both crackers originated in Transylvania – which would you pick? Sheila – I would definitely pick cream crackers over water crackers to be spread with jam, and I am doing my best to be unbiased and imagine that both crackers are made in Transylvania. I just like the creamy flavor of a cream cracker. I ate them with butter and jam and a glass of milk, for a light supper before bed many times as a child. I was just reading to my boys from an Irish stories, poetry, folklore, and blarney book. It contains several receipe for Marshmallow Crackers. The crackers are of course cream crackers which I know my local grocer does not carry. 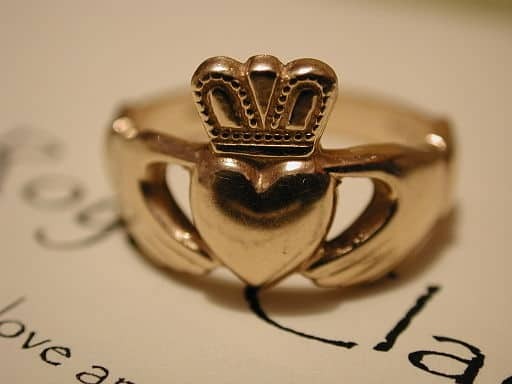 I was so pleased to see your blog about them and now can look up purchasing a quality brand on-line. May the blessing of Saint Patrick behold you! Meaghan – Cream crackers are plain and simple, and a really tasty snack. Marshmallow and crackers sound like a perfect combination. Glad you found my post. Blessings to you and yours too. I thought I was the only one who enjoyed Crackers with butter and jam for supper! Must be an Irish thing! Also very delicious with clotted cream and jam. My grandmother back in Ireland used to call them a cheap version of a scone. Hi Shan – I love your grandmother’s description of cream crackers as “a cheap version of a scone.” What a typical Irish expression – full of wit and wisdon. I have never put clotted cream on a cream cracker but what a delicious suggestion. I must try it. Glad to know I am not the only one who appreciates a good cracker, especially as a supper treat. Ah! The perfect supper, Bernice. Thanks so much for reading my ramblings about cream crackers. Hi Donna – Guinness and cream crackers – now that’s a perfect supper. Enjoy your late night treat. I have read that Cream Crackers are traditionally made using fermented dough. This is actually a health plus — as if you needed another reason to eat these delicious crackers. Hi Janine – It’s lovely to learn that cream crackers might actually be good for us. Thanks so much for adding to our cream cracker discussion. Hi Riana – So glad to hear cream crackers are enjoyed in so many corners of the world. They’re something delicious from my childhood. Your homemade custard slices with cream crackers sound wonderful. 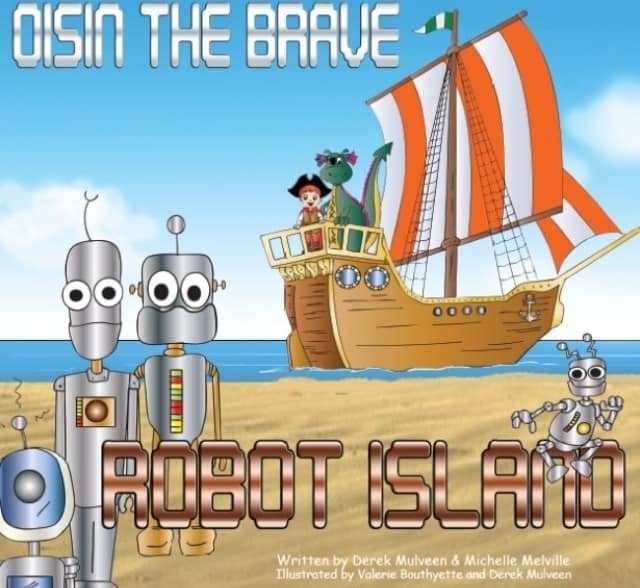 I got nostalgic when you mentioned Bovril – another taste from my Irish childhood. Ovaltine was another suppertime hot drink we enjoyed. I don’t know if that is found in South Africa.